남원 선원사 철조여래좌상(南原 禪院寺 鐵造如來坐像)은 전라북도 남원시의 선원사에 모셔진 철조여래좌상으로 춘궁리 철조석가여래좌상(보물 제332호)과 매우 비슷한 모습을 보여주는 전형적인 고려시대 철불이다. 머리에는 작은 소라 모양의 머리칼을 붙여 놓았고 이마 위쪽에는 고려시대 불상에서 유행하던 반달 모양을 표현하였다. 3각형의 얼굴은 유연성이 사라지고 날카로운 코·꽉 다문 입·내민 턱 등에서 근엄한 표정을 엿볼 수 있다. 양 어깨에 걸쳐 입은 옷은 얇게 표현되었는데, 넓은 옷깃을 오른쪽으로 여민 것은 마치 한복을 입은 것처럼 표현되어 매우 독특하다. 팔과 다리에 나타난 옷주름은 凸자 모양으로 간략하게 처리하였다. 신체는 어깨가 반듯하고 가슴은 건장하고 당당한 느낌을 주며 잘록한 허리에는 두 팔이 붙어 있다. 지금의 손은 최근에 만들어 붙인 것인데, 팔의 형태로 보아 원래는 오른손을 무릎에 올리고 손끝이 땅을 향하고 왼손은 배부분에 놓았을 것으로 짐작된다. 이 불상은 추상성이 짙어 보이기도 하지만 균형 잡힌 체구와 재치있는 주조 기법 등에서 고려시대 철불의 특징을 잘 보여주고 있는 귀중한 작품이라고 하겠다. 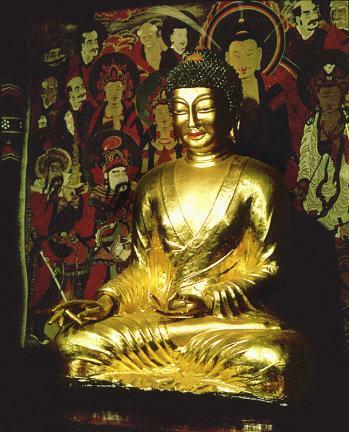 This Iron Seated Buddha at Seonwonsa Temple in Namwon, Jeollabuk-do, is a typical iron Buddha statue of the Goryeo Dynasty, showing very similar characteristics to the Iron Seated Sakyamuni Buddha at Hasachang-dong, Hanam (Treasure No. 332). The Buddha’s hair is expressed in the curly nabal style (i.e. twirled up and around in a seashell-shaped fashion), and there is a crescent-shaped boju (finial) on the middle of his head, a typical feature of Buddha statues made during the Goryeo Dynasty. The Buddha’s triangular face with its sharp-looking nose, closed mouth, and protruding jaw convey a serious expression. 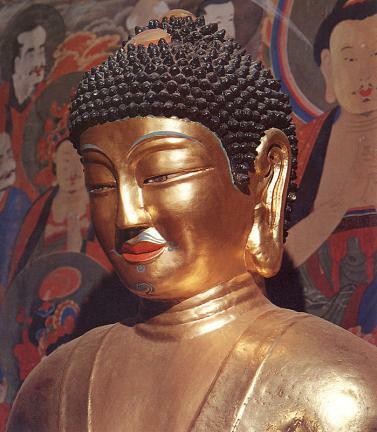 The Buddha’s beobui (robe), which is draped over both shoulders, and his wide collar band adjusted to the right, are uniquely expressed, as if the statue is wearing a hanbok (traditional Korean clothes). The creases in the clothes are expressed in a simple "凸" shape, a popular technique of the time. The shoulders are straight and the chest is solid, giving the Buddha a robust and majestic impression. Two arms are placed around the slender waist. The hands were attached recently, but looking at the arms, it is assumed that the right hand was originally placed on a knee, with the tips of the fingers pointing downwards, while the left hand was placed on the stomach. As seen above, this Buddha statue may appear to have many abstract characteristics, but it is a valuable work that exhibits the characteristic features of iron Buddha statues of the Goryeo Dynasty through its balanced figure and sophisticated casting technique.